Harmony Horticultural Consulting assists the landscape and property management professional or property owner, helping to manage water, plant health care and pest issues to maintain attractive and productive properties. I help to fine-tune both commercial and residential properties incorporating horticulturally-sound techniques with practical applications. I also provide customized training programs for the green industry and private classes for the gardening enthusiast. Frost tender coral fountain (Russelia equesetiformis) is damaged to the ground. 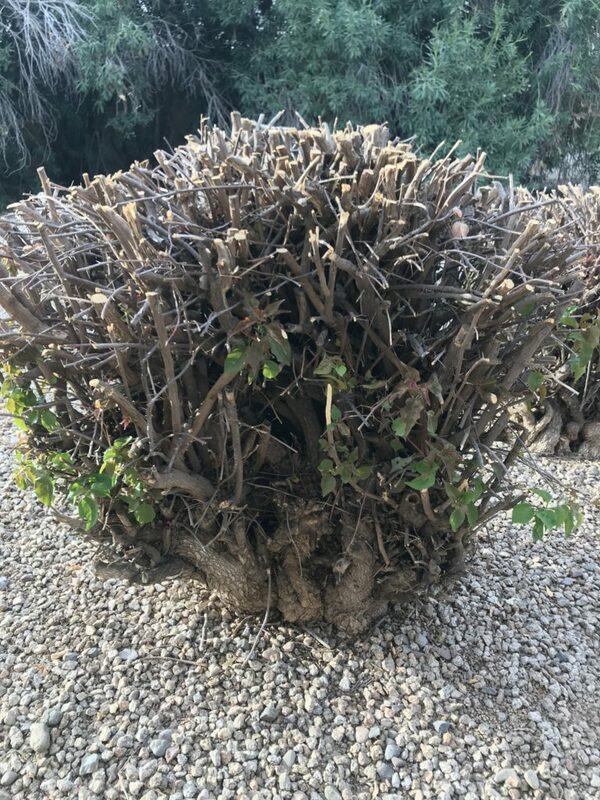 This plant should not be taken back all the way, but selectively pruned, until it recovers from the frost damage in spring, then additional damage can be removed. As you drive around the city, you can see which areas got hit hard with frost damage this year. 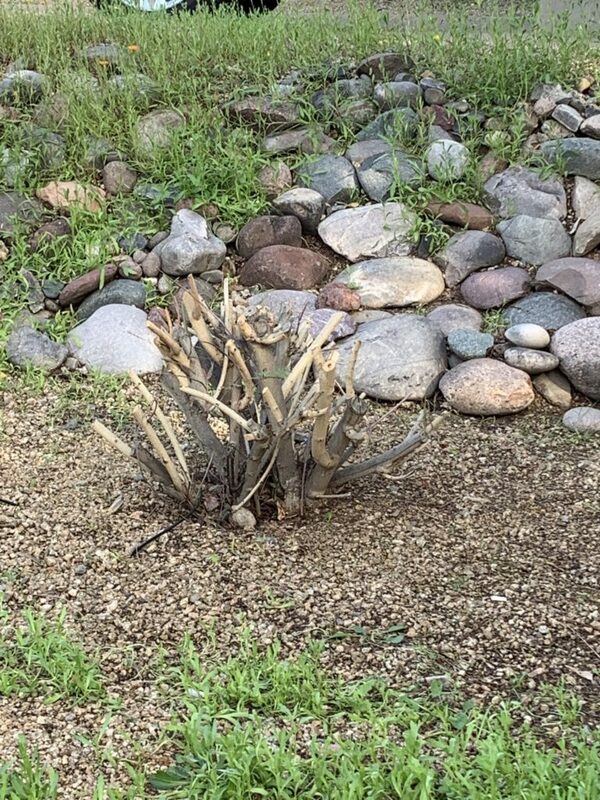 Typically, the city center is a bit warmer than the outlying areas, but even within central Maricopa county, there are cold pockets where you can currently find lots of brown, crispy-leafed plants. 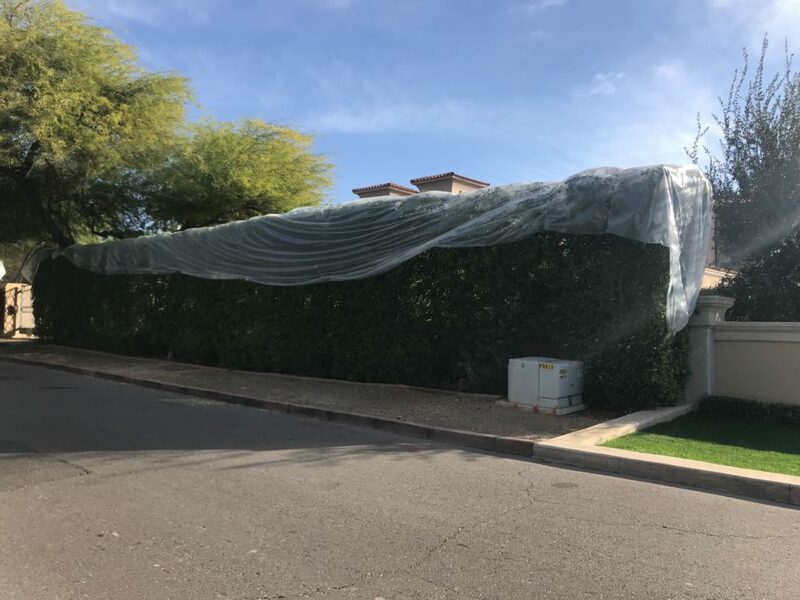 Lots of work went into putting out this frost cloth, which unfortunately provided little protection to this ficus hedge. Lantana freeze most years in the Phoenix metro area. After they are pruned back they recover well and are a full sized shrub in a short time. We haven’t seen any significant frost damage for the past few years and so protecting our plants can be forgotten, unless you caught the warning on the nightly news of the threat of sub-freezing temperatures. Running to Home Depot at 5pm the night before a frost might leave you disappointed to find they have sold their last frost cloth. You exit the store, race home and search the linen closet for any old sheet which might do the job. Tossing the sheet over that large bougainvillea, you feel like you’ve done all you can do to prevent damage to your beloved bougie. I see frost blankets tossed overtop of shrubs and hedges all over town, but I most often shake my head when I think of all the hard work and effort that went into putting it out, but it’s been done incorrectly. How hard can it be to cover a plant, right? But here’s where it gets technical: there is a right way to cover a plant, and there is a wrong way that will offer your plant very little if any protection from the cold. A frost cloth should cover the entire plant, from the top, down to the soil level, where it should be secured in order to trap warm air which raises from the earth. If you do not trap in the heat, you are essentially not providing protection to your plant. Unless you add heat under the cloth (Christmas lights are a popular heat source) it is not protecting your plants from cold temperatures. Proper frost protection, courtesy of the University of Arizona Cooperative Extension. Invest in frost cloths early in the season to ensure they are on-hand when you need them. Drape cloth over top and down to the grown, extending the drape out wide, out towards the drip zone of the plant. Do not secure around tree trunks, since the trunk is not the source of the heat. Know your plants: cover tropical and subtropical plants with cloth, creating a bubble to lock in warm air under the plant. Once you’ve identified the plant, you may check the USDA or Sunset hardiness charts for temperatures plants will tolerate. The U of A Cooperative Extension also has an excellent resource for regional plants. Water all plants the afternoon or evening of the expected frost. Dehydrated plants are at much greater risk of frosting than watered plants. The evaporation of the water will create heat under the plant. If the frost is expected on Monday at 4am, program to water anytime Sunday evening and into the early morning hours of Monday. Cold, dry and clear mornings are the days you want to watch out for… humidity slows temperature change, which is a good thing when it comes to rapidly dropping cold temperatures! Wind is also helpful to reducing the risk of frost damage. Know your property: neighborhoods and microclimates can make a huge difference in what might be damaged by cold temperatures. Typically, properties closer to the mountains are warmer than those at the bottom of the hill. Walls, hardscape, overhangs or canopy coverage by large trees can also help protect plants in an area. Don’t prune plants which are at risk of frost damage in the late fall. Pruning can promote new tender growth close to frost events in the winter. Frost cloths may be left on up to 72 hours, but it is best if they are removed after 48 hours to allow plants access to light. Sheets or other dense covering should be removed daily. Most conventional cloths will protect plants down to about 30 degrees. There are other more industrial cloths available which can protect plants down to 20 degrees, but again, the protection comes from the skill of the covering which will be key in protecting your plants. If you are in a cold area, only plant cold-hardy species. We know those ficus are hard to resist with their glossy dark green leaves, but leave it at the nursery if you are in a colder area of Maricopa county. The red bird of paradise (Caesalpinia pulcherrima) is cut back each January, helping to reduce woodiness and overall size during the growing season. 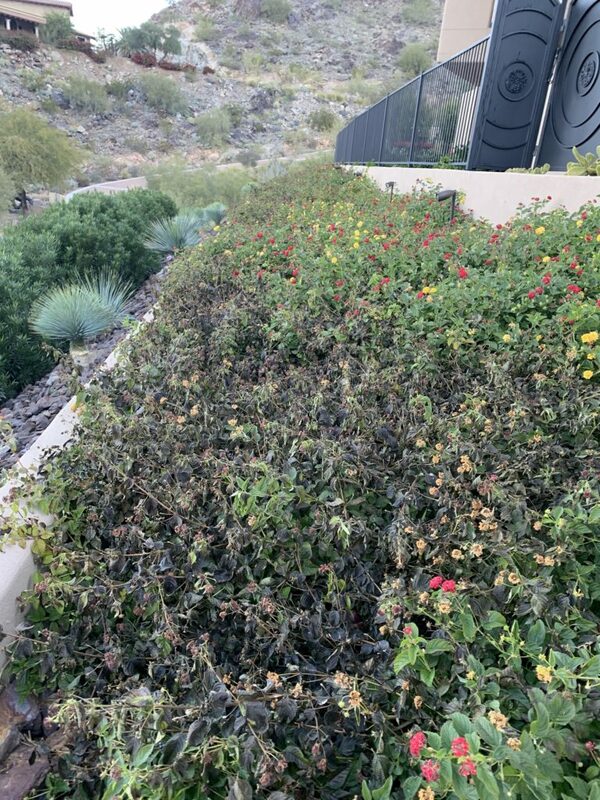 Now that you know how to protect your plants from a desert frost, what can you do to help them recover? The first thing you can do is leave it alone, for now anyways. Typically, the threat of frost declines around February 7th in the central part of Phoenix, whereas other areas in the east valley (Mesa, Chandler) may experience frost as late as early April. Looking at dead plants for two months is hard, believe me, I know! Resist the urge to start removing the frost damage until the threat is nearly past. For the central areas, I feel you can safely start cutting back lantana, oleander, and even bougainvillea around the second or third week of February. In other areas, wait another week or two in case we see another cold snap in the mid-spring. Over the last few warm winters, I have seen many lantana start pushing new growth around the end of January, which would easily be damaged if there was an early February frost. What we don’t want is to promote new growth, only to have it be nipped by a 30-degree morning, which can deplete a plant of energy needed to sprout in the spring. The large bougainvillea was cut back in February to remove damage. However, it also should have been thinned to remove woodiness from inside the canopy. Depending on the species, current size, age and desired size will determine how low you will cut the plant back this season. Trailing lantana can be cut nearly to the ground level, while plants like bougainvillea might take some thinking on before you start cutting. Generally, larger, established shrubs can be cut back 30-50% of their size, if you want to maintain the plant at the same size as it ended the season last year. Rapid growers like the red bird of paradise you can be a bit more aggressive. I typically cut birds of paradise back to about 24-30” off the ground, removing all but a few main branches. This is a great time to thin out woody canopies, creating more air and light to get into shrubs, helping to encourage a more natural growth habit. After removing frost damaged limbs, water your plants well, helping them recover, and as soon as buds form on branch tips, fertilize with a 50% slow release product to encourage slow, even growth. If properly watered, your shrubs should not need to be pruned again until mid-summer when humidity hits and growth excellerates. If you need help with determining cutback height or timing for your plants and area, please give me a call. Before you know it, summer will be here and frost damage will be just a distant memory. A few weeks ago, I had the privilege of speaking at the Arizona Community Tree Council’s annual conference in Prescott Arizona. This two-day event is a great way for Certified Arborist and tree care professionals to earn continuing education credits and also a get a chance to mingle with industry peers. This year, I taught part two of my class series, Tree Disorders of the Desert Southwest which focused on abiotic-caused disorders in trees. Last year’s class focused on biotic diseases, or biologically-caused plant problems. One of the topics covered this year was damage trees encounter during construction. Since we are seeing a surge in our construction industries (yeah economy!) 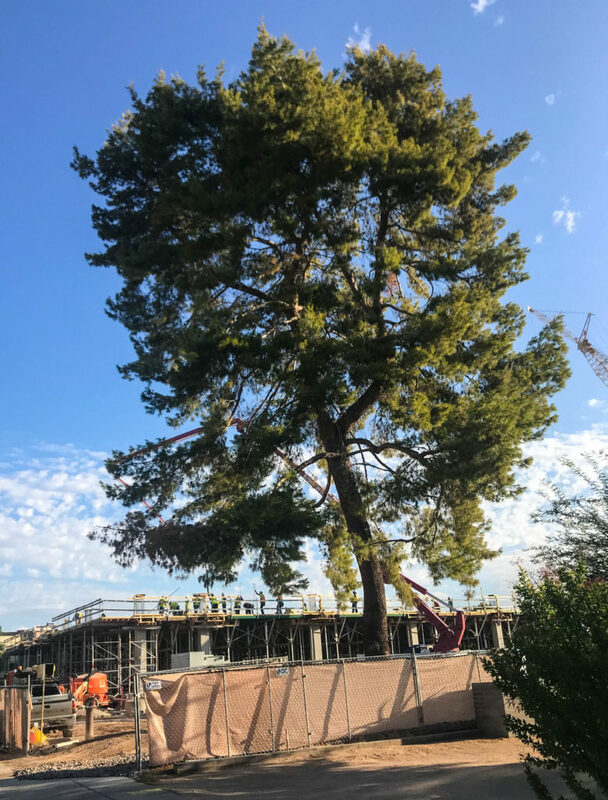 it is a good opportunity to remind our construction managers, crews and property owners that existing trees need a little TLC and protection before, during and after improvement projects. 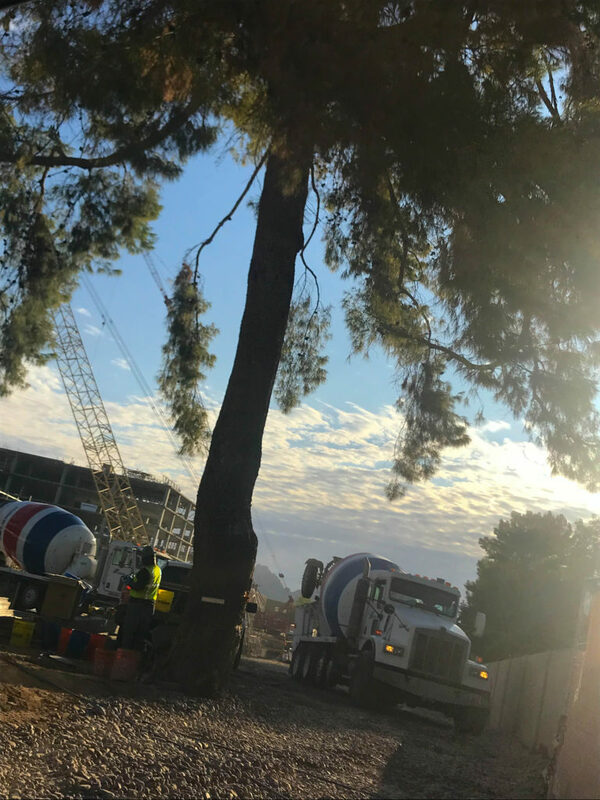 My eyes naturally gravitate towards trees as I drive the streets of the valley, and when i see a fenced in construction site with trees growing inside the protected zone, I am often disappointed to find the trees are a forgotten relic of the property. Vehicles parked under the canopy, tree trunks being used to as a backboard to hang signs, or a great shady spot for the concrete or painting crews to wash out their equipment. All of these can impact tree’s growing environment and therefore affect their health. Unfortunately, this type of abuse can cause extensive damage to established trees both above ground and below. Heavy equipment and repeated foot traffic over the root zone can compact soil, reducing the air and moisture space, which leads to root die back. Physical damage to roots from trenching and changes in soil grade can also impact not only the tree’s health but its structural integrity. Severing a root at least 4” in diameter within 10’ of the trunk can create a risky situation and a liability issue if it was a significant anchoring root. Construction chemicals deposited in the soil can also change the soil chemistry, which can be very challenging to remediate. 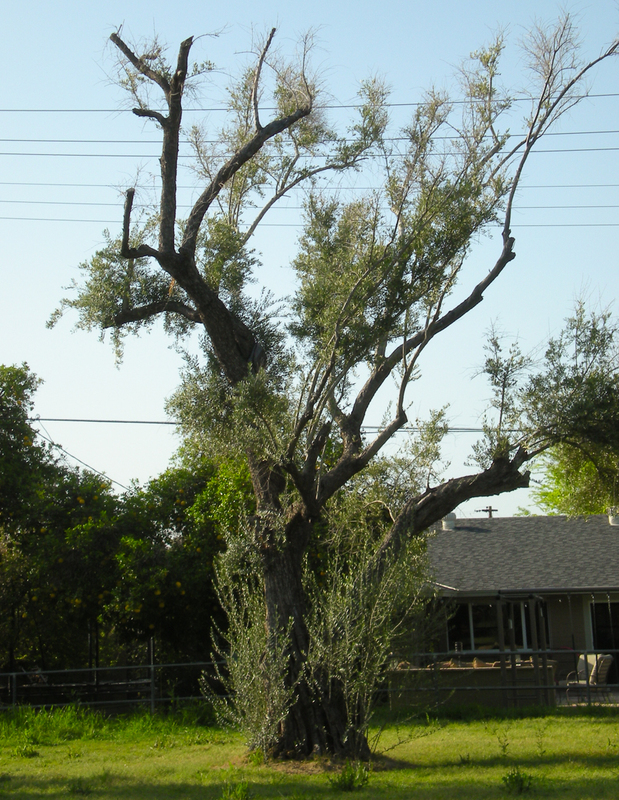 Hire a Certified Arborist to develop a tree protection plan. Initiate a protection plan months in advance in order to help address irrigation changes which need to be made prior to the construction. Barricade off area to protect the ‘critical root zone’ or the area where root damage can significantly impact the trees’ health. Do not allow access to this area by any construction crews. Hang signs on the protected zone informing workers why this area is barricaded, and consider enforcing fines if restrictions are not followed. Establish an alternative irrigation plan if water will be off to the property for a period of time. This is especially important during the summer months when even a few days of a water outage could negatively impact the tree. Do not trim or remove foliage before or during the project. 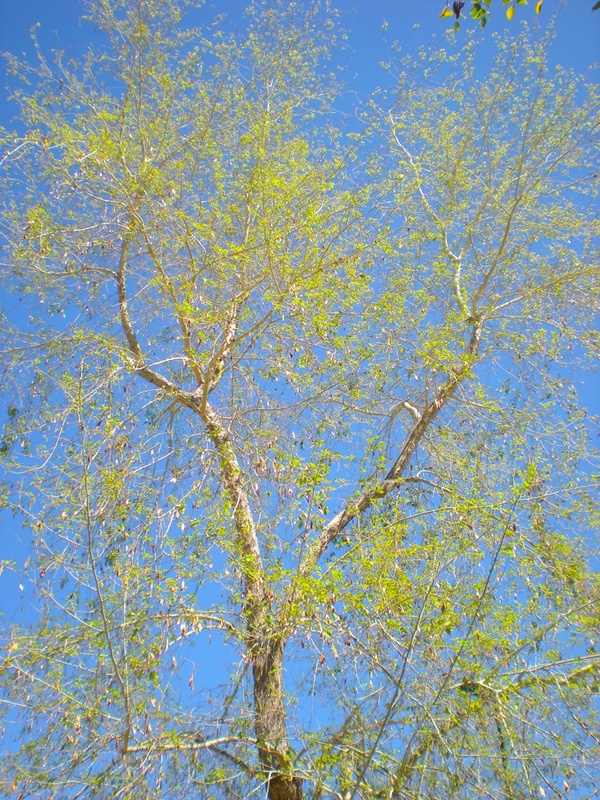 Think of every piece of green on that tree as a little food factory, making food to support the life of the tree. We want to keep all factories in full production during the project to support good health. 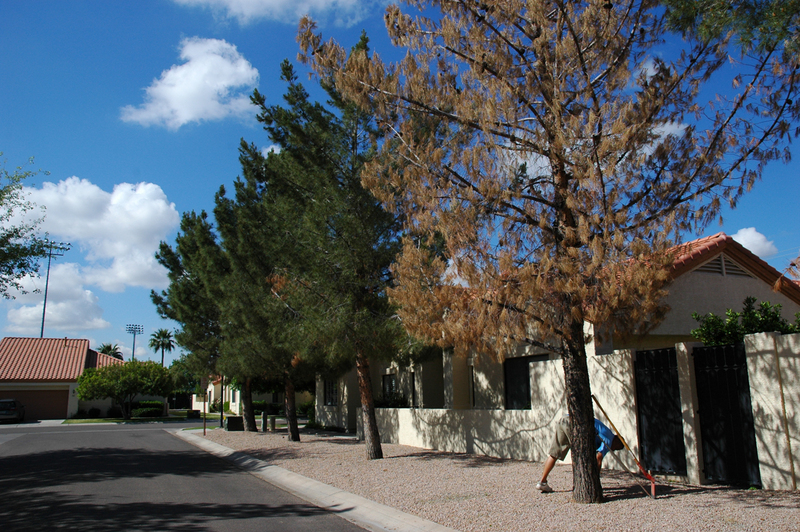 Fertilizer can be considered if the tree is not in good health going into the project. Ask your tree health care professional about organic acids or humic acids, which can help improve the below-ground growing conditions. If trenching or digging is required within the critical root zone, hire a tree care company to ‘air trench’ instead of digging, then lay pipes over, under or around the existing root system. Remember severing roots can not only impact the tree’s health but can also cause structural instability. Construction protection for this tree helping to prevent damage to both the roots, trunk and canopy. If you have finished your project and now are seeing branch dieback, wilting or early fall leaf drop, you may want to have a tree care professional perform a root collar excavation or air spade the soil around the trees to investigate the damage that was done to the tree. Depending on tree species, some may bounce back a year or so after the project. Unfortunately, other species are not so forgiving once their roots are disturbed or damaged. The first step in recovery will be determining if the tree is at risk of failing due to major root damage. The second step will be to make the root system as happy as you can by addressing any compaction issues, fertility issues and also ensuring the tree is receiving adequate water for its age and size. If you are planning a project and would like to protect existing trees on your property, please contact me and we can discuss how I can help develop a protection plan. Remember, some trees don’t show damage for many years after a project is completed, making it difficult to connect the dots between damage and current tree decline. Prevention is the best way to protect your trees, but sometimes giving your trees a little extra attention and care can help with heal back to a healthy state. This month’s ACLP class series is Tree and Shrub Pruning and it reminded me of all the reasons why we should hire a professional to prune our trees. Trees are often the forgotten element in our yards. Sure they provide us shade and refuge from the scorching summer sun, but who calls their tree care professional for an annual health assessment? Generally most of my calls are for ailing trees, not the healthy ones. 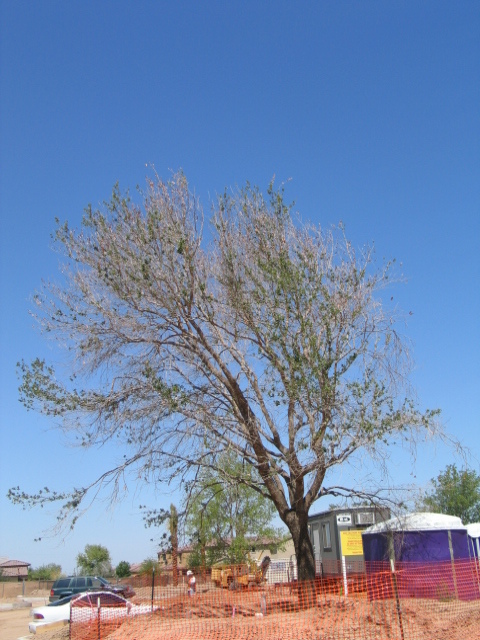 We typically don’t notice the healthy growing trees until they fall in a windstorm, show symptoms of a disease or pest or begin changing in appearance. Older olive tree showing years of inconsistent watering and care. Nutritional disorders, usually due to poor tree choice for the site= queen palms… when will everyone learn: They. Just. Do. Not. Grow. Well. Here. Okay, I’m off my soapbox. Too much or too little water: too much water leaches nutrients, reduces necessary oxygen to roots, slows growth and can make conditions conducive for root diseases. Too little water can also reduce growth, cause wilting, leaf tip burn due to the high concentration of salt in the soil. Disease or pests: while we we don’t have many plant diseases in our arid region, there are a dozen or so pathogens in our soil that can impact plant health or kill a plant. We also have a number of nasty pests that can wreak havoc on select plants. The top disease I diagnose is Texas Root Rot and the pests I most frequently encounter are the Agave Weevil or the Palo Verde Borer. Pine trees declining due to insufficient irrigation after turf to granite conversion. 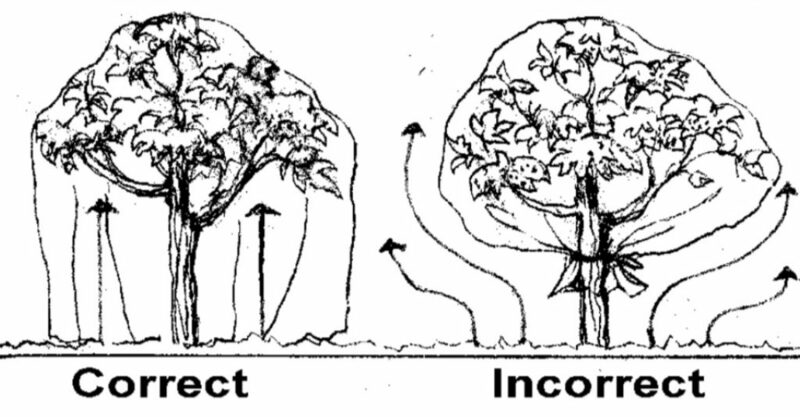 Incorrect soil grade, either from the tree being placed too deeply in the hole at planting or from soil being added to the existing soil, making the grade higher. 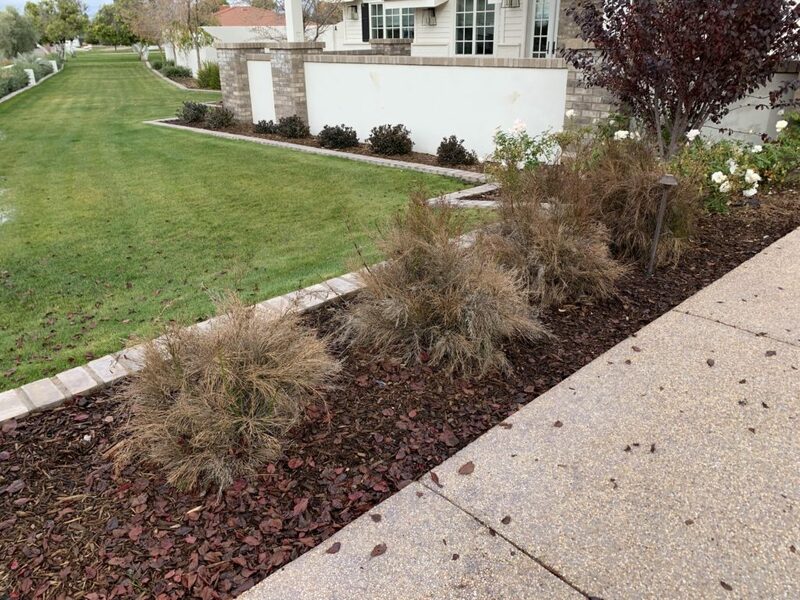 These are very common mistakes made in the landscape and unfortunately trees may not show any signs of stress for many years, making it difficult to make an initial diagnosis. That’s why I most often keep digging, until I find the right answer. 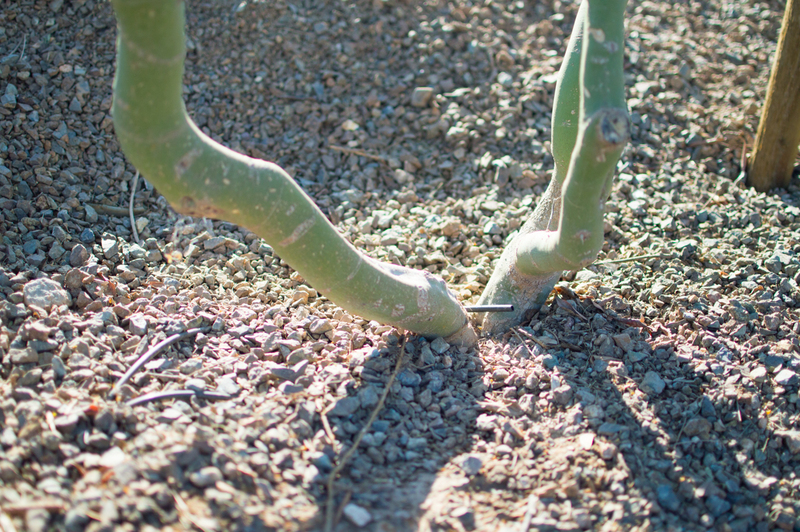 Palo verde has been planted too deeply, which can easily be corrected soon after planting. 3. Broken limbs- can the tree be saved? Depends on the situation. Fast growing species generally have a better chance of recovering than slow growers. Can be subjective- do you want to look at an an ugly tree for 3 years until the tree fills in? No one is judging, it’s your property and if you want a new tree, plant a new tree. Please make sure you hire a certified arborist to help train the young tree for the best branching structure to help prevent limb failure in the future. This can be caused by a number of issues, but the first thing I would look for is irrigation efficiency. Generally when trees are planted, two drip emitters are installed within 12” of the trunk and then they are forgotten. As trees grow, they require a greater volume of water to thrive, especially non-desert trees. Moving and even adding drip emitters to the dripline of trees will help the delivery uniformity of water to each tree. Also, irrigation schedules should be adjusted monthly to meet the water requirements of each tree, which depends on time of year, temperatures and humidity levels and of course the size of the tree. Sissoo showing dwarfed yellow foliage is growing in saturated soils due to irrigation leak. As we approach our summer season, I recommend inviting an ISA Certified Arborist to your property to inspect your trees. The arborist should not only look at the structure of your tree but also its overall health and make recommendations for how to improve the growing conditions of the tree. If you do need pruning, please, please please make sure the company your hire is properly insured to perform tree work, which is not the same coverage a landscaping company typically holds. If you do have tree health care concerns, please feel free to invite me to your property for diagnosis. I am also happy to provide your referrals for reputable companies who will be able to perform the work. 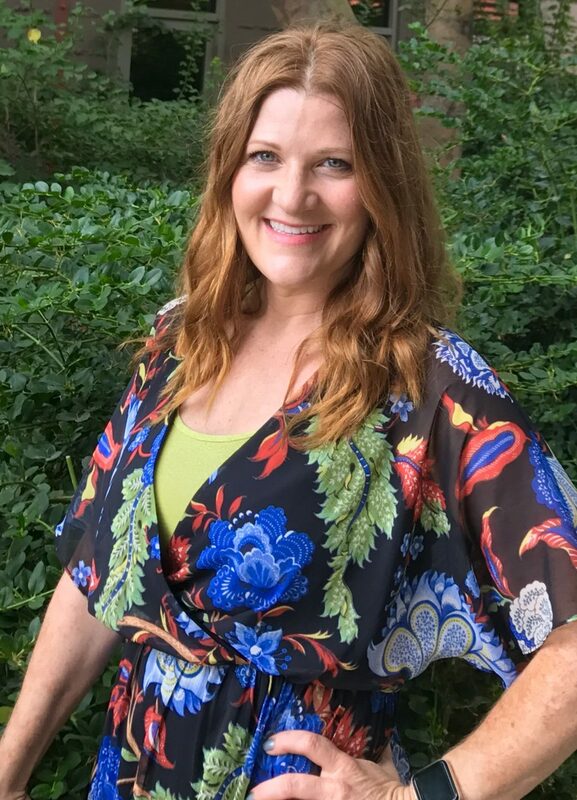 Kasey Billingsley, Horticultural Consultant helping to diagnosis plant and tree problems and offering solutions for every unique landscape problem.